The Mount Morris Park Community Improvement Association will hold its 23rd house tour on June 10. HARLEM — Getting more people uptown to see the beauty of the 100-plus-year-old brownstones of the Mount Morris Park Historic District is one of the benefits of the neighborhood's annual house tour. "People move uptown once they come on these tours. We have so many homes that have been purchased by people who went on the tour," said Syderia Chresfield, president of the Mount Morris Park Community Improvement Association. With plans to potentially expand the historic district in the works, Chresfield thinks the June 10 tour, now in its 23rd year, is more important than ever. The recent collapse of a brownstone in an area they'd like to annex opens the possibility that new, modern homes made of glass and steel could rise before the area is landmarked. Chresfield is counting on the tour to help win hearts and minds over to her point of view about the importance of preserving the brownstones. 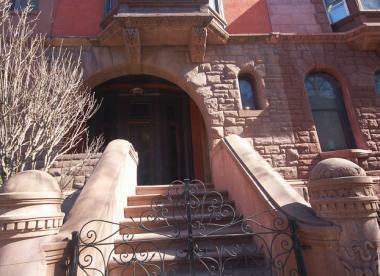 A brownstone on 120th Street that is part of the Mount Morris Park House Tour. "When you actually get into a building and feel it and see the flavor of the district, it takes you back a step in time," said Chresfield. Participants will have several options to choose from, including a self-guided tour of 10 homes and churches, an architectural walking tour and a more intimate tour inside three homes with Yale-trained architect and historian John Reddick. Among the houses included in this year's intimate portion of the tour is the home of documentary filmmaker Albert Maysles and his wife Gillian on West 122nd Street on what was known as "Doctor's Row." Also included is a brownstone on 120th street that was formerly-owned and renovated by the NBA legend Kareem Abdul-Jabbar. Reddick said the Maysles' home is decorated with walls lined with books and a Tibetan theme. The couple moved to the home from the Dakota. It represents a house whose historical elements were preserved. 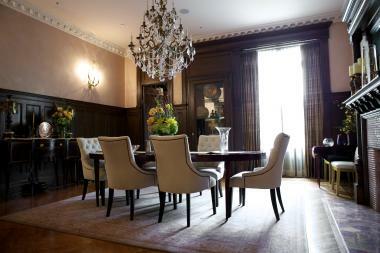 Abdul-Jabbar's house shows how a modern renovation looks inside a historic home. "There is a nesting instinct in every New Yorker. They want to see how others live," said Reddick. "Even when neighborhood was down, the house tours did more than any real estate agent to let people know how amazing the neighborhood is," he added. Chresfield hope that trend continues. "We like the people who live within the glass and steel buildings," she said. "We just hope people in the future want to build something that more complements the neighborhood."